One of my favorite things about Version 3 is the use of only one aircraft instead of 3. 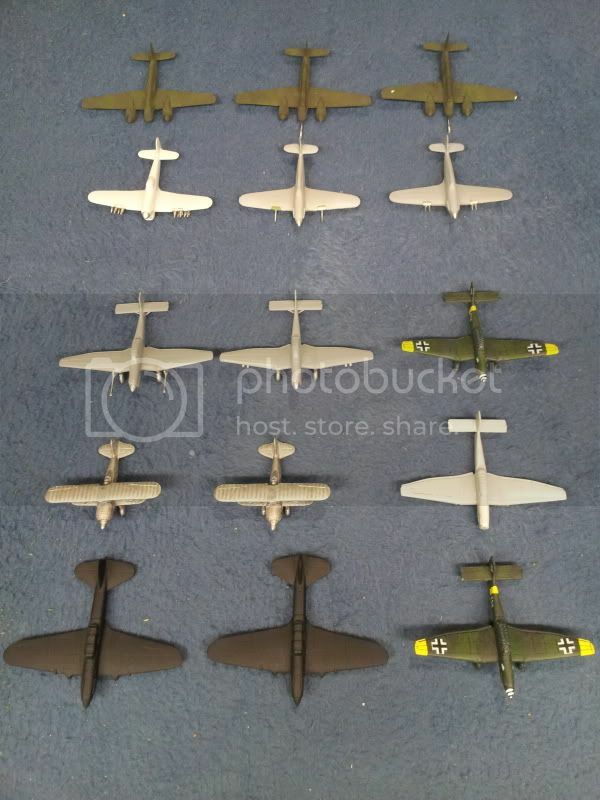 Now I could assemble and paint all the different variations of each aircraft. So, yesterday, I pulled out all my aircraft, planned and built each one based on what I was going to do. In the end I've come up with 15 aircraft I'm going to paint all at the same time. I also decided I was going to dedicate these airplanes to our friend Todd Lemieux and Vintage Wings of Canada. Here are the plans for my 15 aircraft. For the British I have 2 Hurricanes (a C & D), and a Typhoon. Vintage Wings of Canada actually has a Hurricane IV so I am going to paint the IIc the same as it looks to have the same weapons. Then I'll paint the Typhoon the obvious choice. Although i'm not too sure how hard those stripes are going to be. I will paint 2 Strumoviks. I think this is just a beautiful aircraft. Its just right up there with the Spitfire in terms of looks. I'll paint one the 'regular' Eastern Front way. The second one, I'm going to paint this really cool blue way. I think this was flown by some famous Soviet Ace in Chine against Japan...you know when the Soviets "didn't know" the war was over and kept on fighting the Japanese. For the last Hurricane I have, I may actually turn this into a Soviet aircraft. I believe the hurricane was one of the very first Lend-Lease pieces of equipment the allies gave the soviets. Can't use it in the game....yet. 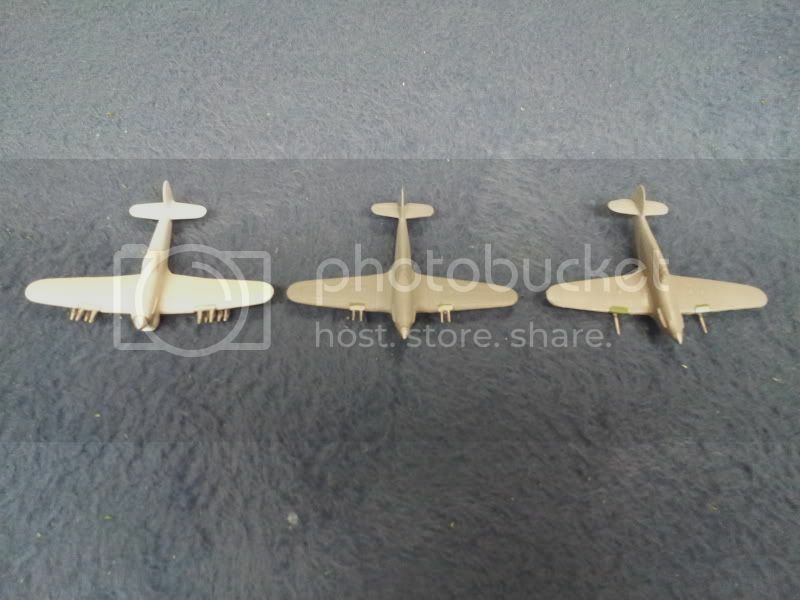 I have 6 Stuka's. I scooped probably the last box of 3 around. I have 3 already painted but decided I would repaint them. They were OK, but I can do better. I've learned a lot since painting these babies. One of the painted ones I'm just going to add a winter wash. Should be pretty easy. 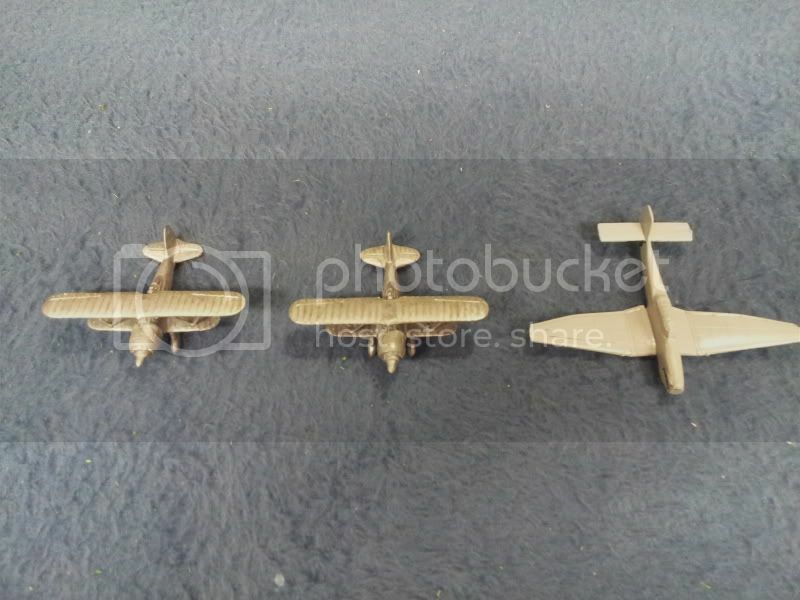 I will also repaint a Stuka D, and paint up a Stuka G. A 4th one I'm not sure yet. I may paint one in Africa or Sicily colours. I will leave one unpainted and maybe trade it or paint it later. The Stuka D I'm thinking about trying in more of a panzer grey colour. I can find a few pictures, but it could be that the colour is faded. Did I mention that I love FoW is only using 1 aircraft now? And it's mostly because of this one. I can now have both the HS-129 B and the HS-129 B-3. 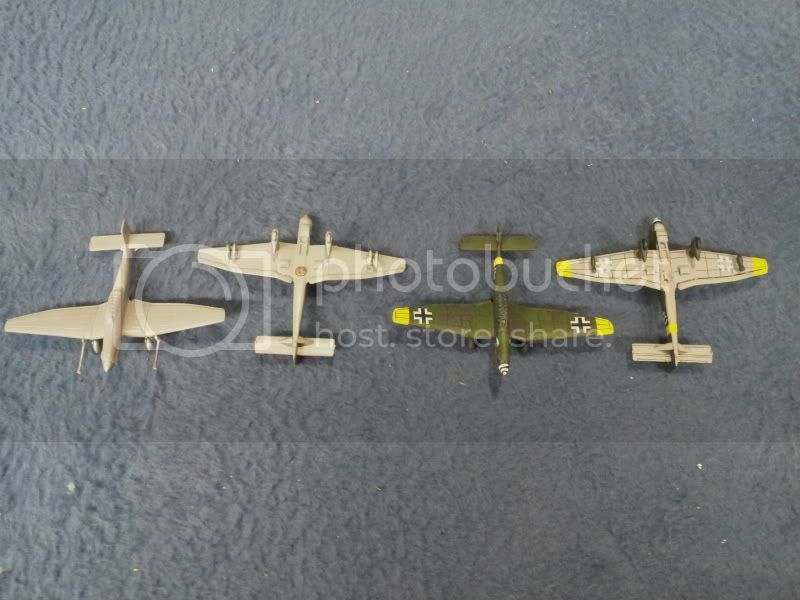 I will have one of each, and then the 3rd one I am painting a winter HS-129 B-3 for my Kampfgruppe Bäke. This is the most common paint of a HS-129 B. But I'm not sure if its correct. I read "somewhere" that the propeller cones on the Eastern Front were blue because the Soviet Nose cones were red. And I think the yellow tail stripe means Russian Front. I hope this next one exists. I may actually paint one of them black like this. And a Winterized one....looks more like a cow. I did say I would paint 5 Stuka's. 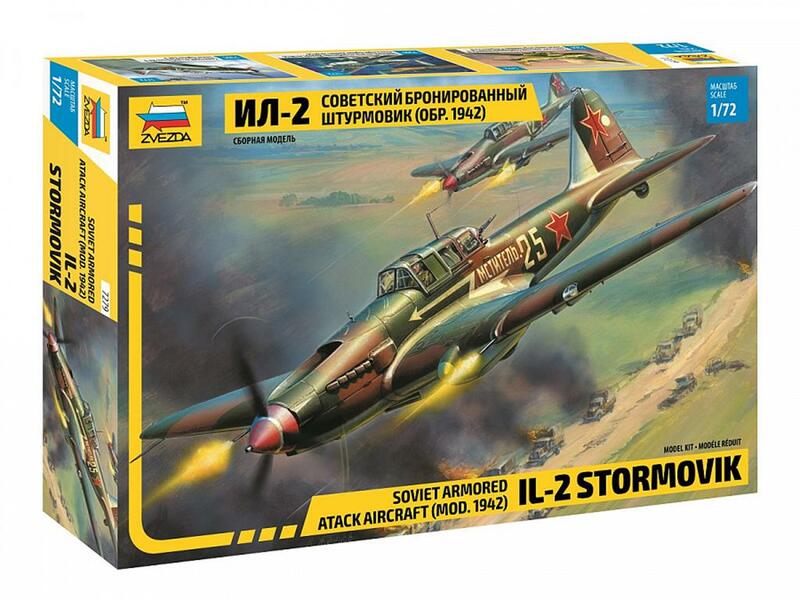 Well the 5th one will be an Italian Stuka for the Eastern Front. Along with that I will paint 2 CR42 Falco's. I will paint 1 CR42 for Africa/Sicily, and one for Greece or somewhere they wouldn't have desert camo. I don't believe any were used on the Eastern Front except by the Hungarians, but i'll paint one that way anyway. Apparently the Falco was the worlds last operational combat biplane. Maybe I bit off more then I can chew since I'm still painting Strelkovy and working on the tournament app, but we'll see. Just a quick preview, here is something new I added to the app. Country colour and unit designations on the matchup screen. This was actually Joe Krones idea and I think it turned out awesome. A tool time will also appear over each icon telling you exactly what company it is.